How the Republic of Mauritius is leveraging Ionic to build their first mobile application, MRAEasy, to facilitate taxpayer filing processes. The Mauritius Revenue Authority (MRA), a governmental revenue administration, needed a way to ease taxpayers’ filing of their returns. 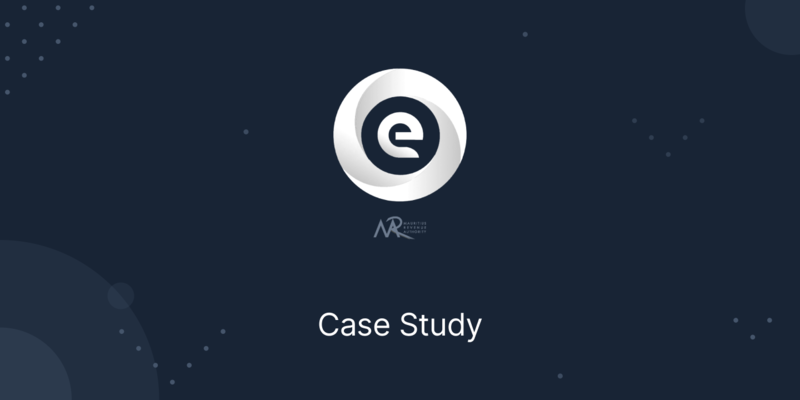 By using the Ionic Framework and leveraging Ionic’s Enterprise Support and Advisory services, the organization was able to deliver the first version of the MRAeasy app in only two months. Launched in January 2018, MRAeasy is a mobile app that allows employers in Mauritius to file and pay their employees’ Pay-As-You-Earn (PAYE) as well as Contributions (National Pension Fund and National Solidarity Fund) on a monthly basis. The iOS and Android apps were developed by the Mauritius Revenue Authority (MRA) with the goal of easing employers’ filing efforts. In an effort to make tax-paying easier for the general public, the MRA development team realized they should bring their desktop web application to mobile. With tax season rapidly approaching, the Director of Information Systems at MRA felt the utmost need for a comprehensive mobile development framework that could deliver a solution for both mobile platforms. It would have to keep their software development costs in check and support easy expansion into many other taxes. The MRA team needed a solution that provided a well-designed mobile and desktop-friendly UI, as well as a single, cross-platform codebase that was accessible to web developers. The MRA team evaluated a number of different development frameworks on their quest to build for mobile, starting with the Oracle Mobile Application Framework (MAF). It initially appeared promising to the team with its ability to deploy to multiple devices and platforms—plus its library of UI components. However, it quickly became clear that the solution was overly complex and a non-starter for a team needing to deliver a working application quickly. Additionally, the proprietary implementation meant that much of the code would have to be rewritten should the team need to migrate their codebase to another framework solution someday. MRA also wouldn’t be able to reuse their codebase to target additional platforms in the future without Oracle providing them as options. After evaluating other technology stacks, the team chose Ionic for its UI toolkit coupled with Angular 2 (now version 5) for the application architecture. Despite being a small team of three (one architect, one developer, and one designer), the frameworks allowed them to move fast, while still writing testable and maintainable code. By leveraging Ionic’s design-centric open source UI components, MRA avoided having to recreate common mobile UI components from scratch, saving countless hours of time and effort. In order to satisfy its goal of releasing an application quickly, MRA went one step further: Signing an agreement with Ionic for Enterprise Support, Advisory, and Training Services. Ionic’s dedicated customer success manager spent more than 40 hours with the MRA team, performing architecture and code reviews, doing live training, and providing ongoing development assistance. “Despite an eight-hour time zone difference, Ken [our customer success manager] was very responsive and a great mentor. His prototypes really helped us get unstuck,” says a Systems Analyst on the MRA team. After just two months, the implementation of the first version of the MRAeasy app was completed. A new benchmark for the team’s mobile app development efforts was reached; previous efforts had taken nearly three times as long to achieve similar results. This has opened new doors for us. MRA’s first mobile app, MRAeasy, launched on iOS and Android to more than 200K users. Through time-saving features such as employee detail management, offline browsing, and an end-to-end payment workflow, MRA has fulfilled its goal of easing the employer filing process. The team is looking forward to continuing to innovate with new features as well as increasing their usage of Ionic’s mobile DevOps services for streamlining the build process and delivering real-time app updates. Currently, they use Ionic Monitoring, which provides proactive error monitoring tools and detailed reporting. Since there is a short window available for MRAeasy users to submit tax returns, being able to identify and resolve bugs quickly is a key motivation for using the service. In the near future, MRA also hopes to implement Ionic Deploy. Tax computations and laws are so dynamic that MRA wants to be able to deploy new business rules in real time, resulting in increased user satisfaction. We look forward to continuing our partnership with Ionic to enhance its mobile strategy and further ensure success in app development.